As you might imagine, we get asked a lot of questions about how to go green here in Charleston. 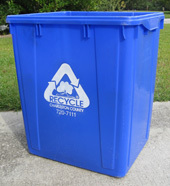 Out of all of those questions, there is one that gets asked more often than all the others: How do I get a blue recycling bin? Pick one up for free at the Romney Street Recycling Plant, The Bees Ferry Landfill, North Charleston City Hall, James Island Public Service District, Charleston County Public Service Building, and the East Cooper Service Center. Call 720-7111 to have a bin delivered to your house. This option can take several weeks due to staff limitations. Special mass pickups can be arranged if a large group of residents need bins. These can be setup at a local school, church, or community center by calling 720-7111.